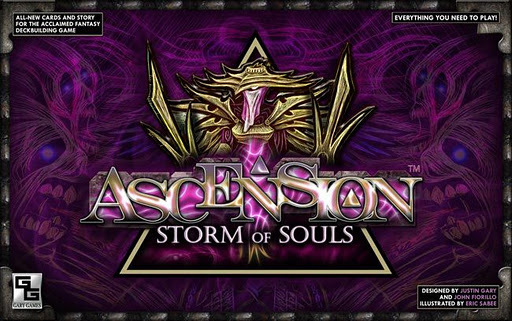 Later this week Gary Games will release Storm of Souls, the third installment to the hit deck building game Ascension. Storm of Souls adds a new card type and new mechanics to the game. Visit the Ascension Official Website for more details about product information, and how you can receive a copy. Justin Gary is the lead designer and creator of Ascension. I was lucky enough to ask him several questions about Storm or Souls, game design, organized play, and much more. Below is a copy of our conversation through e-mail. What was you and your design team’s inspiration for the new mechanics featured in Storm of Souls? Storm of Souls was really the opportunity for us to flourish as a design and development team. Chronicle of the Godslayer was an introduction to the game, and so we had to keep it as simple as possible. Return of the Fallen finished that arch and introduced a lot of the mechanics (like Fate) that were originally in the game but pulled to streamline it. Storm of Souls, as our first full size expansion, really takes Ascension in a new direction, introducing our first new card type (Events) and new Monster type (trophy). While Storm of Souls is fully playable by itself, it is recommended for generally more sophisticated players, as the mechanics give you a lot more options and interesting decisions to make throughout the game. What do you hope Storm of Souls will add to the gaming experience that was lacking in previous sets of Ascension? While I believe each card and mechanic in storm of souls adds a lot to the Ascension game experience as players learn and evaluate the new effects, I believe in particular Trophy Monsters add a ton to the gaming experience. One of the challenges of the heavy power strategy is that players rarely have a lot of decisions to make on the mid-late turns (i.e. kill biggest monster, buy more power). Trophy monsters let you decide when you want to get the reward effect, allowing you to strategically plan the best course of action from turn to turn. What criteria do you and your design team use to gauge and balance the two basic ways a player may build his or her deck (Runes versus Power)? This is a pretty involved question- the short answer is that we playtest a lot (along with getting feedback from our large playtest group of Ascension fans) to make sure no one strategy is too dominant. It took approximately a year to release an expansion to Chronicle of the Fallen. With two new sets out this calendar year, what kind of release schedule should players expect from Gary Games as far as new content for Ascension? How many promos, base sets, and expansions will Gary Games produce each year? We don’t have a set release schedule- our focus is on quality first, so we will only release a set when we believe it is awesome. I’m hoping this amounts to about 2 sets a year with enough promos to keep people excited about new content in between, but we aren’t committing to that. Gary Games recently announced Organized Play events with top finishers receiving electronics. This type of marketing contains many parallels to the OP of a trading card game. Will the future of organized events and marketing of Ascension model itself like a trading card game? Are these types of events something players should expect on a regular basis, similar to the Magic: the Gathering Pro Tour? Does this type of marketing aim to capture TCG players or provide a service that your company feels is missing from the board gaming community? Ascension is a game that appeals to both board game players and TCG players, and since our team is made up of many Pro Tour players (and champions), of course we are inspired by that organized play model. This summer, we had over 140 people come to Gencon to play in our Godslayer tournament- where Aaron Sulla was crowned the Godslayer (and will appear as a card in a future set). Ascension’s most successful OP program is its Game Day program, where players can get free promo cards by going to their local stores. We will continue to try different styles of Organized Play with the focus being more about getting people to enjoy hanging out and gaming more so than a focus on the top end prizes. Is there any official guidelines for players to build their own custom center decks? Do you have any rules you would like to share with us? What type of conventions should players follow if they want to play with cards from every set, but limit the amount of cards in the center deck? What do you feel the maximum amount of cards players should play with in the center deck? In general, I recommend keeping a similar rune/power cost ratio to what we currently have – if the acquire/defeat costs get too high, then the game can stall out and won’t be as much fun. Players can play as many cards as they want – the more cards you have, the more variation you will have from game to game but the less you can rely on key cards coming up to support a given strategy. Otherwise, I don’t want to restrict players at this point- I built the center deck(s) I think are best already – I’d like to see what fans create and how they work! One could argue that Lionheart is a almost strictly better version of Nairi, Hedge Queen. How do existing cards affect your team’s ability to design new content? When do previous cards inspire new card designs? Have preexisting cards hampered new content, and if so, what is the solution to fix that problem? We still have a lot of space to design cards in Ascension and I don’t feel hampered by old designs- Lionheart and Nairi fill different niches in the game, even if they look a bit similar. Every set is going to need some ratio of cards to fulfill the basic functions of the game (banish cards from deck, banish cards from center row, gain power/runes/honor, etc.) but we like to make each set’s cards combine together in a way that feels coherent and highlight’s that sets mechanics. The example you mention above shows what I’m talking about. Nairi was the first card we made that produced honor but didn’t replace itself or provide any other effects. Lionheart fills a similar niche but highlights one of the set’s core mechanics (Unite) to make it even more powerful if you build your deck correctly. Storm of Souls will add a lot of great dimension and new levels of strategy to the game. Adding more decision making to power heavy decks is a step in the right direction. Gary Games’ focus on quality versus quantity really shows in the new content in Storm of Souls. Ascension should demonstrate positive growth over the next year or so given the company’s point of view on organized play. The fact that Gary Games organizes events show great initiative to build interest in the product; however, keeping the goal of organized play limited to building interest as oppose to competition for prizes allows the gaming atmosphere to stay friendly and minimizes sharks. So many trading card games have failed in the last several years in part because their OP efforts gave away too many prizes. It shaped a player base that cared about winning stuff as oppose to the product, the actual game players were playing. If players are not already excited about Storm of Souls and Ascension, they should be. The product looks great and the company possess great values for producing quality products and programs. Special Thanks to Justin for taking time out of his busy schedule to answer my questions. Special Thanks to Shari for organizing this interview. For more information about Storm of Souls, check the product page on BoardGameGeek.com.